Google has been given the green light by planners for their occupation at the S2 office building at Argent’s King’s Cross Central scheme. The new office development will be wholly occupied by Google, after a 15 year lease was agreed on the 180,000 sq ft property. The rental figure is believed to be around the £55 psf mark – a discount on the average rent at the scheme (£75 psf) due to the plans not being submitted. The news follows the letting of 4 Pancras Square by Universal Music, also on the Argent development, in October 2015. The music giant has signed a pre-let for 177,000 sq ft where it will base its Headquarters, moving over 1,000 employees from Kensington. The building is due to be complete in the summer of 2017. Alongside Universal Music and Google, Kings Cross will house global media firm Havas, fashion giant Louis Vuitton and PRS for Music. 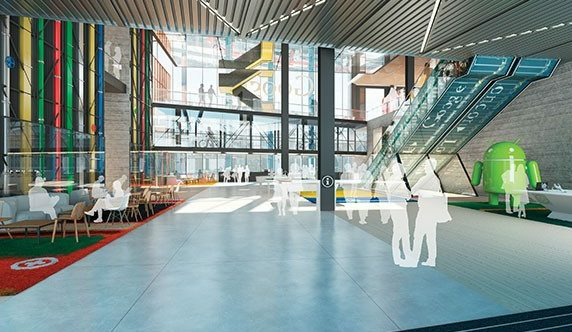 The area is fast becoming a hub for the creative industry and the letting of S2 to Google is further testament to the pull factor of the new development. There are expected to be 12,000 people working at King’s Cross by 2017-18 and there is still c. 700,000 sq ft still to be let across the development.